A wild jojoba nut and flower. “I get out of the shower, and immediately use your Jojoba Oil, the best moisturizer I've ever tried, hands down. I've tried many moisturizers. Anything petro-based just clogs my pores and causes problems. But this Jojoba Oil is just fantastic. I've learned to love 'simple;' just one phenomenal ingredient = no problems. First I apply it to my tattoos, then my hands, forearms (wash too much through the day), cheeks, and neck. All tough spots for me. Then, and this is the best... my hair. 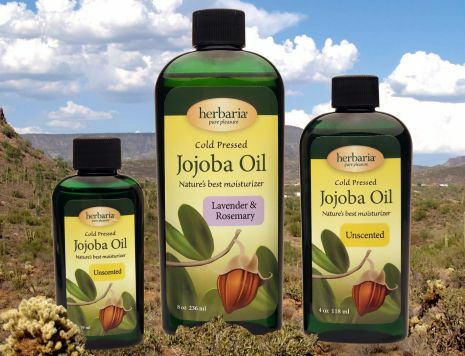 I just rub the jojoba oil all over my hands and give my hair, scalp-to-ends, a good going-over. I currently have half-used containers of outrageously priced, supposedly 'all natural,' assorted gels, Aussie products, Sebastian Potion 9, and Jonathan Dirt in my bathroom. Do you know how much space all that nonsense takes up?!? I was always looking for a great leave-in conditioner AND styling product in one. Now, I have found it. Nothing compares to it. This oil is the single best thing that's ever happened to my hair. My comb glides through without a hitch. I don't feel greasy, I don't feel dirty, my hair is thoroughly moisturized, and it stays where I put it without looking shellacked. I don't bother with any conditioner in the shower anymore--no need. “I am definitely digging this product. I was previously unfamiliar with oil-based moisturizers (having used only lotions before), but it's a really nice departure from the norm. Just the smallest splash of Organic Jojoba Oil is enough to moisturize my entire face. And because so little goes so far, I'm not sure I'll ever make a dent in this bottle, even though I'm using it daily! This golden cold pressed oil mimics sebum, the naturally protective secretions of your sebaceous glands. Use it liberally after your shower. Applied directly to your face, hands, arms, torso, legs and feet, jojoba provides a noncomedogenic, antimicrobial moisturizer for healthy skin. It also promotes healing for dry or itchy skin. Jojoba oil has has the longest shelf life of these liquid moisturizers. Scientifically, jojoba is considered a liquid wax. As a wax, it waterproofs and protects your skin from daily irritants. It will absorb very quickly and leave no oily coating. In addition, it contains beneficial Vitamin E (natural tocopherols) and small amounts of phospholipids. The origin of this botanical treasure is the desert area of Mexico and the southwest United States. You may pronounce its name “ho-ho-bah,” giving it the Spanish pronunciation, or “joe-joe-bah,” as it is in English. Our Jojoba Oil is unscented, but for your added pleasure, you may order it lightly fragranced with lavender and rosemary. Each bottle of Organic Jojoba Oil counts as 1 bar toward our free bar offer.